Questions About Parts Or Accessories? Let Dalt's Honda help with all your tire needs. We have a great selection of All Season tires. Let us help you find the correct set for you and your vehicle. Genuine Honda Parts. 5 Year Warranty! Engine oil lubricates the engine's moving internal parts to protect them against wear and reduce friction. It also creates a protective seal between the moving and stationary parts, all while helping to cool the engine. As engine oil deteriorates with time, it loses its ability to properly protect the engine. Follow the recommended oil changes intervals specified by your Honda's Owner's Manual or Maintenance Minder system (if equipped). Honda 0W-20 engine oil is a full synthetic formula that provides advanced protection against oil breakdown for a cleaner running engine. Oil naturally becomes thicker at lower temperatures and thinner at higher temperatures. Oil viscosity is how thick or thin an oil is, which affects how it flows in the engine. Thinner oil has a lower viscosity, and therefore flows faster. The thin properties of Honda 0W-20 engine oil allow the oil to circulate more quickly, reducing engine operating temperatures and increasing cold start protection when most engine wear takes place and reducing friction to promote lower fuel consumption. 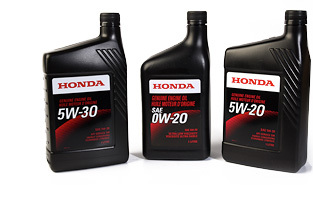 Reduce engine wear and protect your investment by choosing Genuine Honda 0W-20 engine oil. Applicable to most model years - consult with your Honda dealer for compatibility. Engine coolant acts to absorb and regulate the heat that is naturally generated by the engine to keep the engine running at an optimum temperature. It also contains anti-freeze to permit operation in very cold temperatures, while at the same time protecting the cooling system components with its anti-corrosion properties. As the coolant's properties deteriorate with time, it is necessary to replace the engine coolant at the recommended service intervals. It is also recommended to check the coolant level regularly. Coolant loss may indicate a cooling system problem or leakage that could lead to engine overheating and damage. When the brake pedal is pressed, the brake fluid transfers hydraulic force to the brake calipers to slow or stop the vehicle. Brake fluid tends to absorb moisture from the air and as a result the performance of the fluid deteriorates over time. Brake fluid should be replaced every 3 years. The brake hydraulic component system should also be inspected for leaks or damage. Brake fluid is also contained in the modulator that controls brake system pressure during ABS (anti-lock brake system) and VSA (vehicle stability assist) operation. Each time the brakes are used, a small amount of friction material, or "lining" is worn off. Eventually, the thickness of the lining will diminish to the point where replacement is necessary. When this occurs is directly related to your driving habits, operating conditions, vehicle usage and frequency of brake maintenance. Did you know? 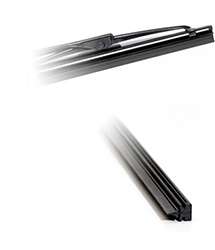 Honda wiper blades are designed so you can replace only the rubber insert and not have to change the whole blade. This makes replacement quick and cost-effective. Your Honda dealer can provide and install the proper sizes of Genuine Honda rubber inserts for your wiper blades. Being able to see clearly is critical when driving in rain and snow. This is why it is very important to check your Honda's wiper blades for damage periodically and watch for signs that they are wearing out and in need of replacement. If you find sections of a blade's rubber insert missing or torn, or it is leaving a streak or not clearing moisture from the glass efficiently, it is time for replacement. Most Hondas are equipped with an air filter to remove dust, pollen and debris from outside air that enters the passenger cabin through the heating and air conditioning system. As the cabin air filter gets dirty, air flow becomes restricted and the volume and velocity of air exiting the ventilation ducts reduces. 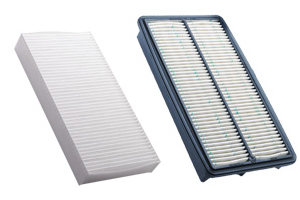 Periodic replacement of the cabin air filter is specified in the Maintenance section of your Honda's Owner's Manual. More frequent replacement may be necessary if you often drive in dusty conditions. Your Honda's engine has an intake air cleaner which contains an air filter element that prevents foreign materials such as dust and debris from entering the cylinders. If foreign materials make their way into the engine, they cause internal damage and premature wear. Whenever the engine is running, the air filter is removing and collecting foreign materials from the intake air and will eventually accumulate enough that replacement will be necessary. A clogged air filter affects engine performance and can increase fuel consumption and contribute to engine oil contamination. Air filter inspection and replacement is required at specific maintenance intervals, as indicated in the Owner's Manual or by the Maintenance Minder system, if equipped. If you often drive in dusty conditions, more frequent replacement may be necessary. 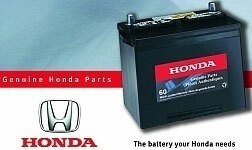 Your Honda dealer can provide and install the correct, Genuine Honda filter for your vehicle. Depending on the model, the drive belt operates the water pump, the alternator, and the power steering pump. It also drives the air conditioning compressor on A/C equipped vehicles. Belt replacement is necessary if the belt becomes worn, damaged, or as the rubber deteriorates due to age or contamination. 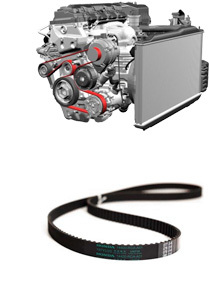 Belt failure can result in engine overheating, loss of power steering, inoperative charging system, and A/C. The timing belt drives the engine's camshaft(s) to open and close the intake and exhaust valves at the proper time. 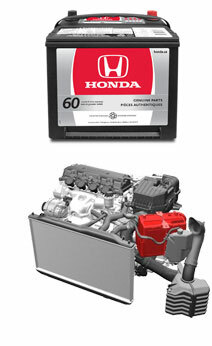 On some Honda engines, the timing belt also drives the water pump to circulate the engine's coolant. 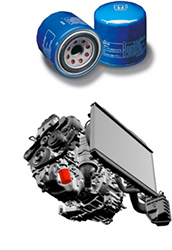 Some engine models also have a second smaller timing belt that drives a balancer shaft system to cancel out engine vibrations. Periodic timing belt replacement according to your Honda's maintenance schedule is critical to avoid belt failure and potential engine damage.